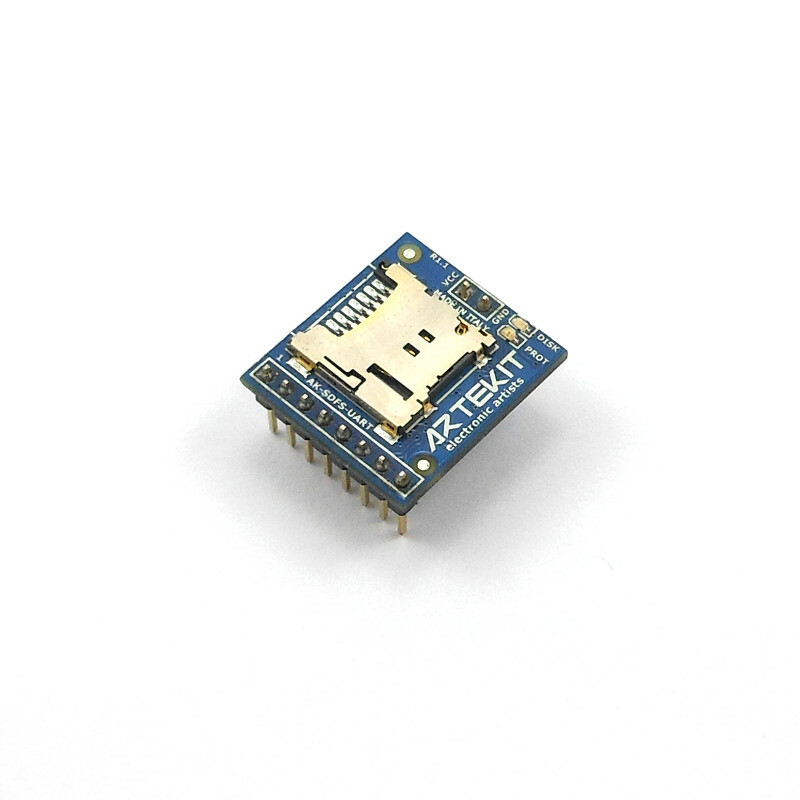 The AK-SDFS-UART allows you to write and read files from a standard microSD with FAT file system using an UART. 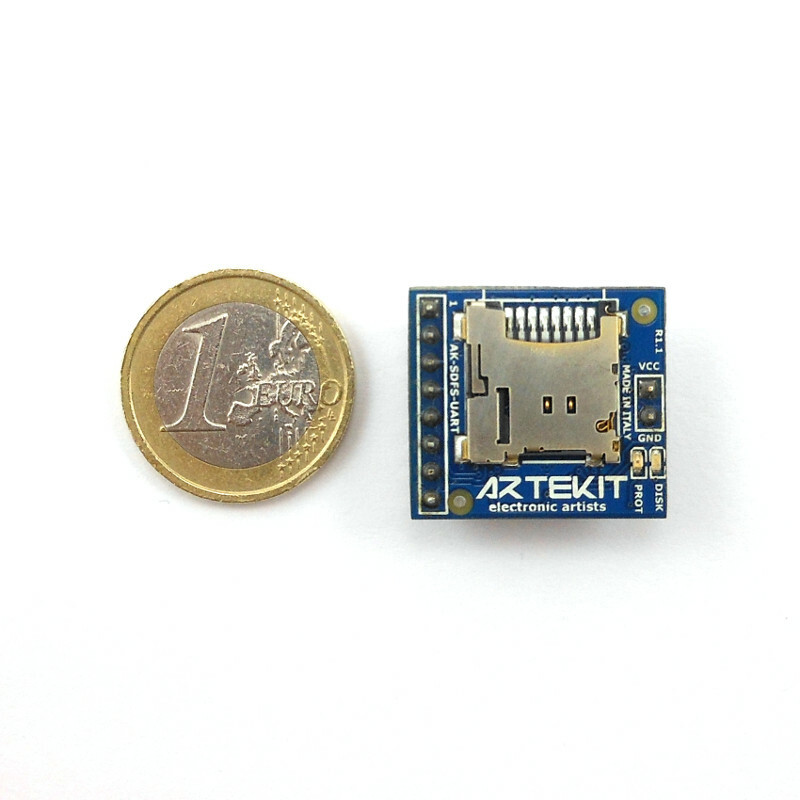 The AK-SDFS-UART board allows you to read/write data from/to a micro SD card using a serial TTL port (UART). The board supports the FAT file system so the files can be read back from the micro SD on a PC/MAC. Using a simple protocol (libraries included) you can read/write 4 files concurrently, in text or binary mode. Using only four wires (TX, RX, VCC and GND) you can read and write from the SD using very small microprocessors, even 8-bit ones. The baudrate can be adjusted from 9600 up to 460800 bps. We have prepared a library that encapsulates the communication protocol and the source code can be downloaded. There is also an Arduino sketch demonstration available for download. 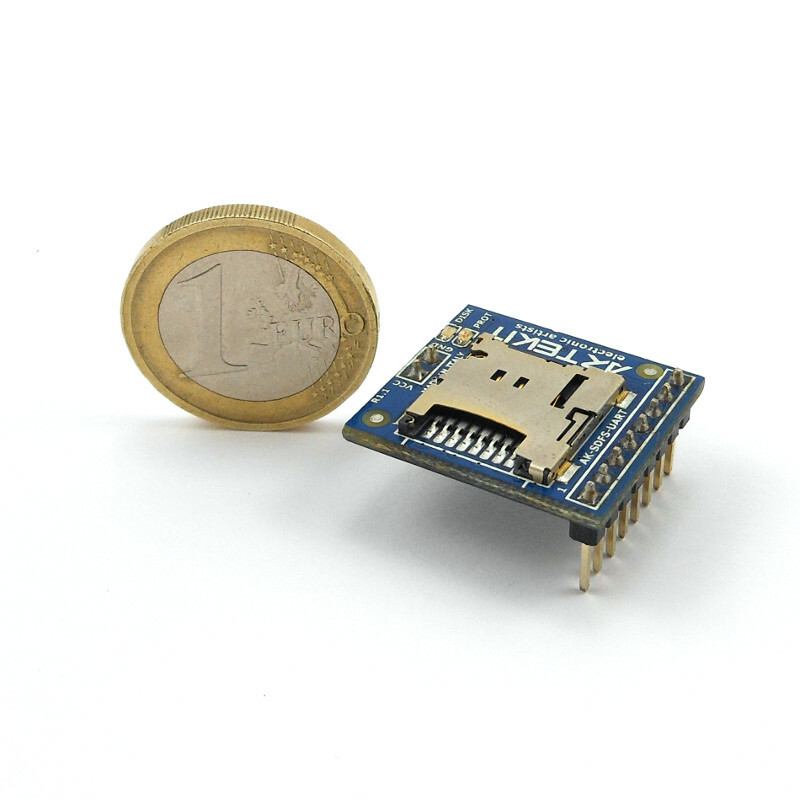 The AK-SDFS-UART is perfect to be used as a data logger, for sensors and debug information. It supports micro SD and SDHC cards. We also have a standard SD version of this board. 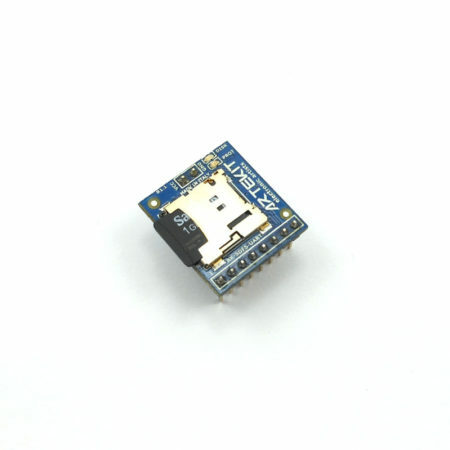 Hello, are there any libraries/guide in C for interfacing the SD card Shield with ATMEGA16L MCU? There is the protocol library, written in C, that is generic (the link is up here in the description). 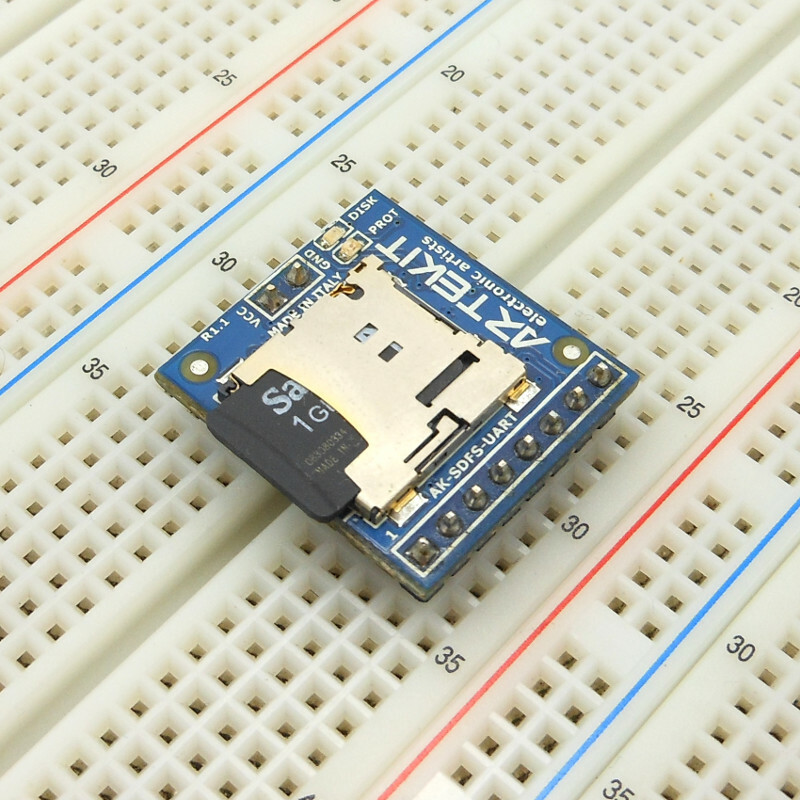 Since it’s microcontroller-agnostic, you have to provide 3 functions: one for serial data transmission, one for serial data reception and one implementing a delay. Hi Andy. 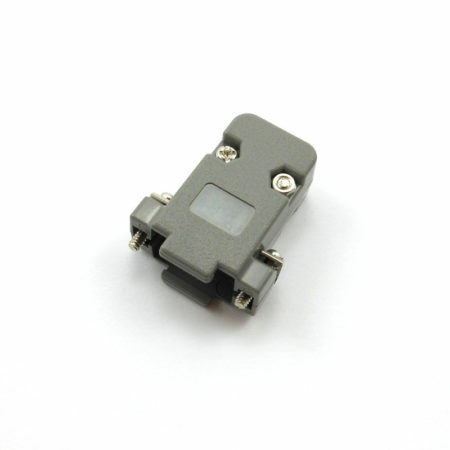 Thank you, we will consider introducing a regulator in future models. This looks great and I have ordered one. Do you have information on sustaoned write rate or how fast I can write to disk. So say I had a single file open, how long would it take to write for exampe 1,000,000 bytes, assuming continous transmission ( say by DMA) on the client side. Hi Andy. 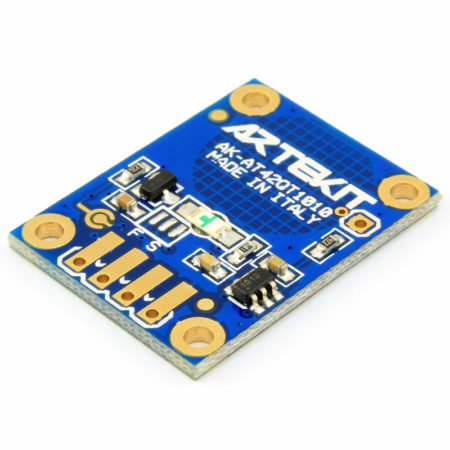 With a 460800bps UART, you can write more or less 16KBytes/s. Testing on PC at 460800 baud, I seem to be getting a write speed of 28,00 bytes per second. I guess its dependent on SD-card. I am using class 10 SD-card, but they say there is a fair bit of variation. Anyway it is a nice product :). I wonder if it would be possible to up baudrate to 1000000 or 1,500,000 or even to 4608000? 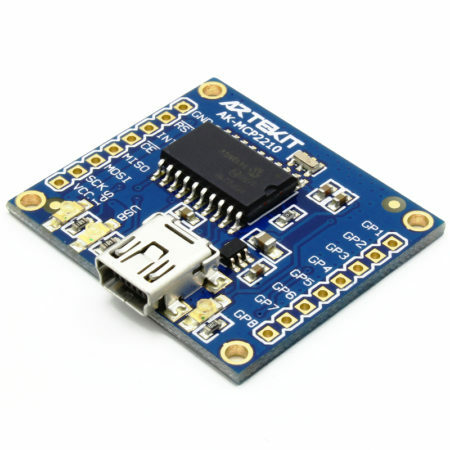 I am sure STM32F1 is capable. Also the docs dont mention any higher baud than 115200..
Nice. Yes, we got 16KB/s with a class 4 microSD. Thanks for the tip about the documentation. We’ll update it with the right baudrate values.